The Green Lantern Press is pleased to present 1:1, a site-specific installation by Lou Mallozzi based on two 2005 excavations from Krems-Wachtberg, an archeological site near Vienna where the artist was in residence in 2015. The first excavation, dated to 25,000 BCE, features the oldest known burial of two infants in a single prepared grave. The second, from the same period, includes one of the oldest painted objects ever recovered, a piece of ivory with eleven stripes of red ochre. Though the find has unprecedented historical merit, Mallozzi’s initial response was emotional, triggered by the care taken for the twins’ burial. Out of this, Mallozzi began an investigation that framed the dig within a contemporary art context: How do archeologists exploit the slight horizontal differences between topological layers, and how does this horizontal difference become vertical as a dig deepens? What presence does red ochre add to the marking of history in dirt and fragments? How does forensic cataloging double museum cataloging? For 1:1, Mallozzi explores this archeological and emotional material by continuing his work in site specific architectural and sonic installation. One half of the installation, Planks, floats eleven clear acrylic replicas of floorboards from Sector 2337’s main gallery over their doubles. 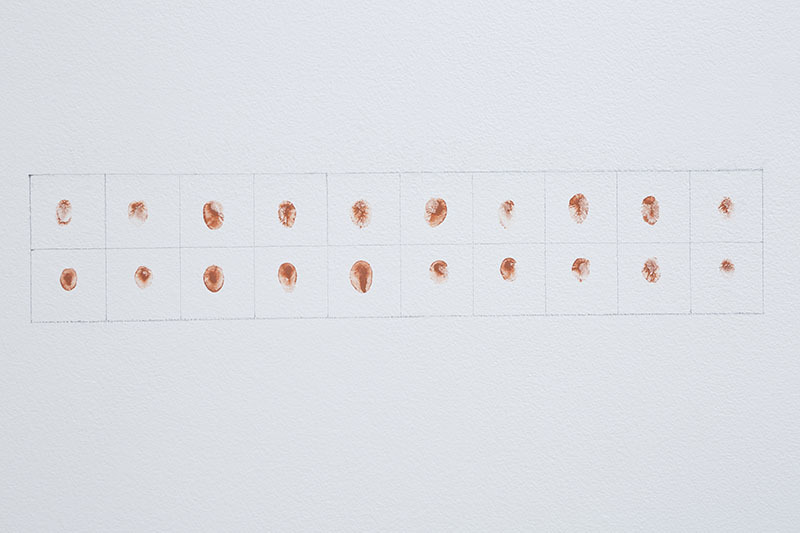 Twins occupies the entire southeast wall of the gallery and consists of a pencil-line grid divided into eleven sets of twenty squares containing the fingerprints of eleven sets of twins from the Chicagoland area. Presented alongside this show is an artist-made catalog, including original source materials from Mallozzi’s research, related images and artworks, and scholarly essays by Seth Kim-Cohen, Susy Bielak and Fred Schmalz, Bryan Markovitz, and Joseph Clayton Mills. Lou Mallozzi (b. 1957) is an interdisciplinary artist whose work often focuses on sound, language, and acousmatics. During his more than three decades of interdisciplinary arts practice, he has performed, exhibited, and broadcast in a number of venues in the US and Europe, including the Museum of Contemporary Art Chicago, The Arts Club Chicago, The Renaissance Society, Randolph Street Gallery Chicago, Podewil Berlin, TUBE Audio Art Series Munich, Bayersicher Rundfunk Munich, New American Radio, Experimental Intermedia New York, Ausland Berlin, Radiorevolten Festival Halle, Constellation Chicago, and many others. 1:1, Installation view, Sector 2337, Chicago, 2018. Photo by Clare Britt. Lou Mallozzi, Twins, 2018. Photo by Clare Britt. Lou Mallozzi, Planks, 2018. Photo by Clare Britt. Lou Mallozzi, Planks (detail), 2018. Photo by Clare Britt.